Is It Possible To Have A GDPR Compliant Mailchimp Newsletter? Struggling to get your head around what you need to do for GDPR? Worried you’re going to break the law with your next email to your list? Is it possible to have a GDPR Compliant Newsletter? GDPR is now in force. We all need to comply. Whether we understand it, or not. There is a big hoo-hah about GDPR regulations concerning keeping people’s email addresses. You love your business and want to spend time getting better at what you do and learning more about that, not boring legal details. But, you have made lots of contacts. How can you keep communicating with them and lead them to the point of working with you? What about past or existing clients? How will you stay in touch with them and remind them of your work or update them on new ideas or products without a newsletter? And as you can’t just add people, but need proof they have agreed to be on your mailing list, how would you populate a list anyway? Maybe you already have a list of some sorts but just don’t know what to do with it now? Should you delete everyone? Ask everyone to re-subscribe? And how will you do that? What If Someone Could Prepare Your GDPR Compliant Newsletter For You? What if you could have someone who would just do it all for you? Someone who makes it their business to know all the legal stuff so that you don’t have to? Someone who is a whiz at Mailchimp and can help you to target potential and current clients. Set up a Mailchimp account on your behalf. Already got a Mailchimp account? With your permission, I can access your account and sort it all for you. Set up an email template that matches your website. Prepare all the necessary sign-up forms and landing page. Email all of your current contacts asking them to subscribe to your newsletter. Email any contacts on your existing mailing list, asking them to stay subscribed. Register your business with the ICO so you can have a Data Protection Licence. 1 hour free training so you can send your own emails. All done for you without any anxiety on your part. You can just get on with what you do while I sort this out for you. 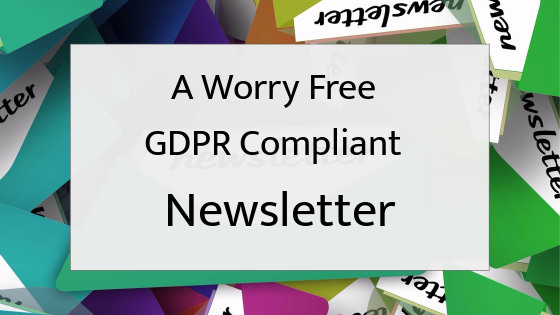 You will have a GDPR compliant newsletter without any stress. and let’s get this sorted. Let’s move this off your “to do” list and onto mine. Then you can have the freedom to do the work you actually started your business to do. Once Your List Is GDPR Ready, Why Not Let Me Help You Build Your List? Leaving you time to enjoy your real work. Once you have your list you need to populate it, or it will be very lonely. You know you can’t just add people to it without permission so how can you tempt people in. You may have a diamond special offer but if people don’t know about it they won’t sign-up. That, however, takes some time to put out on social media and you want to concentrate on your core work, not get caught up on admin on a daily basis. Wouldn’t it be great to have your notifications pinging away without you putting in any effort? All done for you without any anxiety on your part. You can just get on with your real work, whilst I sort this out for you. Liz manages my Mailchimp newsletter and keeps me on the right side of the law. Nice one! Recommended!